A lovely ministers meeting today. I debuted a new GPTV which people loved. Many said it was the best ever. I hope to have it on this site in the next week or so. I've been doing a lot of web surfing and have not found anything worthwhile to pass on, so let me give you a couple of my favorite quotes to relax with and contemplate. On this level, you don't grab. You can't possess, and you can't hold on to anything. If you try to possess, you lose. You can't even possess your own body. But if you love yourself, if you love the Soul within, you have access to all things. We shut down God by moving into the world, professing God's greatness out there. And we've lost track that God is inside us in the greatness. "There is a simple next step to everything, and that simple step can always be taken in a relaxed way." He is actually quoting me, which at times is either a tremendous compliment or extremely irritating. Nevertheless, it is helpful for me to keep it in mind. It is a great antidote for overwhelm. I also tell myself that time is malleable. I actually don't know whether it is or not. But it seems to work to say that it is. Don’t lose in your fantasy. Always win in your fantasy because you’re making it up. Don’t make it up as bad; make it up as good. When you worry, you’re holding pictures in your mind that you want less of, but the law of Spirit says, “What you focus upon, you become. What you focus on comes to you.” So hold in your mind what you want more of. One thing you can do that helps with clarity, is write down the details of what you envision. Make sure you put yourself in the picture you are describing. This is a fantasy you are starring and winning in. It can also help to have colored crayons and draw pictures. It’s a joy to think that we can create in cooperation with Spirit for our highest good, regardless of the times we live in and the ups and downs of the economy. There is endless supply and we have full access to that as we practice the spiritual principles of abundance and prosperity. The commonest confusion I see with people, on a weekly basis, is that they equate abundance and prosperity with dollar (or pound or euro) bills. It’s not about that. It is about connecting with the divine. Of course, we need to be practical and take care of the financial area as we have discussed in this blog at length, but that is a small part of the story. For now, stay with your focus. Is GM too Big to Let Fail? I wrote in 2004 that GM was essentially bankrupt. They owed more in pension obligations than it seemed likely they would be able to pay, without major restructuring of the union contracts. I was not alone in such an assessment, although there were not many of us. Now that assessment is common wisdom. Bloomberg today cites sources that claim a collapse of GM would cost taxpayers $200 billion if the company were forced to liquidate. The projections also called for the loss of "millions" of auto-related jobs. GM, Ford, and Chrysler employ 240,000. They provide healthcare to 2 million, pension benefits to 775,000. Another 5 million jobs are directly related to the three auto companies. GM has 6,000 dealerships which employ 344,000 people. According to a recent study by the Center for Automotive Research (CAR), if the domestic automakers cut output and employment by 50 percent, nearly 2.5 million jobs would be lost and governments would lose $108 billion in revenue over three years. How did we get to a place where its stock price has dropped from $87 in early 1999 to $3.10 today? Where Rod Lache of Deutsche Bank has a "price target" of zero for GM? "Even if GM succeeds in averting a bankruptcy, we believe that the company's future path is likely to be bankruptcy-like," Lache wrote. The litany of reasons is long. At the top of the list are union contracts which mandate high costs and pension plans which cannot be met. Then there is the problem of many years of poorly designed cars, although they are now getting their act together. We can also discuss poor management and bloated costs, like paying multiple thousands of workers who are not actually working. GM is structured for the 50% market share they used to command, whereas now they only have 20%. Let's all acknowledge that having GM go bankrupt would not be a good thing. But it is not the end of the US automotive industry, nor even of GM. Let's think about what a GM bankruptcy might look like. In a bankruptcy, the debt holders line up to come up with a restructuring plan so that they can maximize the return of their loans or obligations. The shareholders get wiped out, but with GM down over 95%, that has largely been accomplished. That process has happened with airlines, steel companies, and tens of thousand of other companies. It is called creative destruction. First, let's understand that the real owners of GM are the pension plans, as I wrote in 2004. They are the entities with the largest obligations and the most to lose. They are the biggest stakeholders in a successful GM. Giving them the responsibility for making a new, leaner, meaner GM with realistic union contracts would be rational; otherwise they would lose most of what they have. Factories need to be closed. Auto sales are down to 11 million cars a year, the lowest since 1982, which was the last major recession. Automotive companies sold cars at such low prices in the last few years that sales went to 16 million a year. But the cars that have been sold will last for a long time. Few people are going to buy a new car when the old one is working fine, especially in a recession and a Muddle Through economy. Further, does GM really need eight automotive lines, some of which have been losing money for years? A restructured GM with realistic costs could be quite competitive. They have some great cars. I drive one. It is four years old and so good I am likely to drive it for at least another four. At some point after the restructuring, the pension plans could float the stock on the market and get some real value. If actual pensions need to be adjusted, then so be it. While that is sad for the GM pensioners, is it any sadder than for Delta or United Airlines or steel company pensioners who saw their benefits go down? For the vast majority of Americans, no one guarantees their full retirement. Why should auto trade unions be any different? Taxpayers in one form or another are going to have to pay something. Unemployment costs, increased contributions to the Pension Benefit Guarantee Corporation, job training, relocation, and other costs will be borne. So, it is in our interest to get involved so as to minimize our costs, as well as help preserve as many jobs as possible. The bailout for GM is a bailout for the trade unions and management. US consumers are simply going to buy fewer cars in the future. That is a fact. Spending $50 billion does not address that reality. That $50 billion can be better spent by helping workers who lose their jobs. Without serious reforms a bailout will simply postpone the problem, and there will be a need for more money in a few years. And do we think that the management which got GM into the current mess is the group to bring them out? Do we protect Circuit City? Sun just announced plans to lay off 6,000 workers. Where is their bailout? Citibank announced 10,000 further job cuts today. This is a recession. And sadly that means a lot of jobs are going to be lost. GM workers should have no more right to their jobs than a Sun or Citibank or Circuit City worker. Last night I was interviewed by Sheila Grace Harvey on her Internet show, Relationship Revelations. I read the following excerpt from the The Rest of Your Life, a chapter I picked out at random, in the form of a meditation. As I was reading, I was so moved by these words in this chapter from John-Roger, it was as if I was seeing them for the first time, and it is so apropos for this blog. Reading it is a great way to end your weekend or start your week. "When you live life knowing that you are worthy of God’s presence in your life, you bring good and abundant things into your life. You are open to God’s love, so love comes to you. You are aware of the joy in your life, so you manifest more joy. The essence of the Soul is abundance. Spirit is naturally abundant because it is the substance from which all things are created. There is nothing that is not Spirit. To be abundant from the Soul level does not mean having access to many things; it means having access to the essence of all things and being in communion with the one essence. When you are in that divine communion, you never feel lack. So if you want to experience true abundance, practice divine communion." Sitting in silence with the essence of the tea bowl, now within me, brought me to a place of fulfillment, quiet, and abundance. Even though I wasn’t going to possess the tea bowl physically, I lacked for nothing and was complete. Quietly, behind my back, she enlisted the help of the group and everyone pitched in and bought the tea bowl for me. That afternoon our guide, Steve, the two of women who helped with the collection, and myself went to the potter’s home to collect the tea bowl. The potter was not there but his beautiful wife took us into the living room and taking the bowl in hand explained that the bowl had a soul (they take their tea bowls very seriously), and that the tea bowl is made by two artists. The first is the potter but the most important is the second artist, me (the owner)--how I use the bowl determines its future. So I had the blessing of the physical bowl plus the inner bowl. I still have the tea bowl and enjoy its beauty every day. From that experience I discovered that everything is inside of me and I didn’t have to possess a lot of material things. That through attuning to something’s essence, or at least the essence as I perceive it, it could also vibrate inside of me and I could experience the fullness of having it. For example, I love nature but I don’t get to be in it as much as I would like. But being present with a plant or a tree can unfold the experience of being in nature inside of me. I was working on the final stages of What’s It Like Being You? and the editor of the book told me she was having difficulty with the above quote. She said that she didn’t know what it meant. 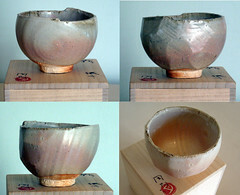 So I told her the story of my Japanese tea bowl and she exclaimed, “I get it now! You must write that story one day.” So here it is. In 2002, I was traveling in Japan, as facilitator of a PTS Zen of Spirit trip. Steve Beimel, our guide, was treating us to a panoply of cultural delights and it was at one these, a 13th generation artisan potter’s shop, that a trainee approached me and said for me to choose something I like and that she would treat me to it. I chose a $12 plate and handed it to her. She laughed and indicated that she anticipated me acquiring something a little more expertly crafted, and thus of higher value. The thought both delighted me and made me nervous and I was unable to select anything despite a wonderful display of tea bowls—something I really wanted. The tea bowl is a sacred object to many and is used to whisk up a hot cup of matcha (finely ground high quality green tea), usually as part of what is known as the Tea Ceremony. Time ran out and I along with the group journeyed on, led by Steve, to another expert potter--one who was less traditional and more artistically inclined. We sat down in his living room as he gave us a short talk. I was relaxed and happy and in my reverie I peered to the side at the collection of pottery on the shelf next to me and my eye caught the most beautiful tea bowl I had ever seen. I picked it up and held it adoringly. Every aspect and every angle inspired and moved me. Then I tentatively checked the price. At first I thought the label said $200 but on closer inspection it was 200,000 yen (about $1,800 at the time). It was too much to ask the kind trainee to pay for and I knew I had to let it go. But how could I do that? I decided to sit in silence and take the essence of the tea bowl into me. I knew I could take that with me, and if I could truly take in the essence the tea bowl would be mine as an inner reality, even if I didn’t have it with me physically. Yesterday's post brought up more thoughts for me. Shelley and I don't go to Ikea simply because we are happy with what we have and even an innocent visit there, "Let's just see what they've got," would inundate our senses with things that we never knew existed, and thus did not want, but with which now we can't live without and must have. Similarly, I avoid pouring through catalogs that arrive in the mail or glare at me from plane seats. So is all this avoidance of friends' homes and Ikea, lack? Possibly, but I am reminded by J-R saying, "The eyes are always hungry" and being aware of that I try to keep them satiated by what I already have. Now I must confess I do visit Amazon.com often, where, as can be seen from my purchases, my eyes appear to be consistently starving. But I digress. In living the spiritual principles of abundance and prosperity, one of the baselines is the quote that heads this post--living from the fullness. This quote is so rich with meaning and has informed my approach to life. If I should go into lack, I remind myself that I lack for nothing and return to the fullness. Am I kidding myself? No, not when I stay within my own experience and don't look into the world for reasons to feel deprived. The above is one of my top all time J-R quotes, and opened up a world for me, as I used to think of imagination to be on a lower level and certainly not equated with the divine. Fortunately my ignorance is in the past but these days I find the quote a particularly useful and relevant antidote to the apocalyptic scenarios that have become a daily media event. When we look at putting into practice the spiritual principles of abundance and prosperity, to me a healthy place to start is with a good and positive divine imagination through which positive scenarios can be continually envisioned and held in our consciousness. Many years ago, J-R gave my mother a prayer to say in answer to a question she had. The question escapes me, but I have always remembered the answer--"Lord, I am grateful for all I have, and I am open to receiving more." That has helped me a lot. What used to put a brake on my imagination/envisioning was the thought that I was being too greedy. Starting with gratitude for what I have, asking for the highest good, and being open to receive more, are now my starting points. Then I feel free to imagine whatever my heart desires. A year or so ago I was putting together a PTS course on Health, (it's still in the works, BTW), called Spiritual Principles of Health and Well-Being. Barbara Wieland our ace staff member in charge of the John-Roger Library and Archives was working with me researching material and quotes. After some extensive work that she had done, I was chatting to her and asked casually what stood out to as a theme in J-R's material on the subject of health. She said she would think about it. Barbara got back to me with a thoughtful response the next day. She said that what stood out to her was J-R's repeating to hold thoughts and images in our mind of what we want more of. It was a great moment for me because I had heard J-R say it hundreds of times but Barbara mentioning it in that context, and isolating it as a key theme, had a major impact on the way I have directed my energy since. Funny how these things come together. In the same way, holding in our mind what we want is a great place to start when we approach the spiritual principles of abundance and prosperity. And of course it is critical to the process of seeding. It's incredibly freeing, magical even, to let go of holding onto things I don't want and move to holding on to more of what I do want. Inherent in the process is getting clearer on what I want in my life and thus being able to submit a blueprint to God for manifestation. (For the highest good, of course). Last year I jumped on the bandwagon and watched The Secret. I simply had to find out what everyone was raving about. I can summarize it for you in a sentence, it's what J-R has said repeatedly over the years; hold pictures in your mind that you want more of. What a concept!